The Nike Kobe A.D. NXT gets high satisfaction scores from the majority of reviewers. They add that it is generally a better shoe than its predecessor the Kobe A.D. Most of the users comment that the shoe’s traction is as good as Russell Westbrook’s second signature shoe. Many of the reviewers praise Nike for using a combination of textile mesh and Flyknit on the upper. They say that the upper feels great and is very breathable. Almost all of the testers say that the Kobe A.D. NXT’s fit is phenomenal. Even without the laces tightened, they already experience a great locked-in feel. Some players appreciate the shoe’s lacing system; saying that it is quick and intuitive, easy to use, and really locks the foot down. One user is surprised that unlike other low-tops, he only experiences low foot fatigue when wearing this shoe. A few reviewers remark that moving is easy when they were these basketball shoes from Kobe Bryant’s growing line. A lot of players say that as long as you get the right shoe size, the A.D. NXT is a very comfortable shoe. The majority of wearers just love how the Kobe A.D. NXT looks like a lifestyle shoe. One mentions how he experienced people stopping him on the streets just to ask him what shoe he’s wearing. Almost all of the reviewers agree that at $200, the shoe is very expensive. Some users are complaining that these Kobe Bryant basketball shoes are very narrow like the 33rd Air Jordan. They warn wide-footers to skip this shoe. Because of the shoe’s snug fit, the A.D. NXT is notorious for being hard to put on. The shoe will need some break-in time since some users experience blistering after playing in the NXT for just a few hours. One user says that after just two rounds of basketball, he already sees substantial wear on the edge of the shoe’s cuff. Some say that it is a hassle to tighten the shoelaces in the forefoot area while others don’t know what to do with the extra laces after tightening them since the nylon laces are too long. A lot of commenters mention that the shoe's cushioning starts off stiff and needs to be broken in. One user worries about the plastic toggle on the lacing system; saying that it might break easily because of the foot’s pressure. He adds that this piece should have been made of metal. After the disappointing release of the Kobe A.D., many are surprised by the Kobe A.D. NXT’s performance. Erasing the memory of its predecessor, the shoe holds its own on-court with its consistent traction, unique lacing system, and fantastic fit. It fixes most of the mishaps of the A.D. and even goes a step further by having new technologies. Traction and cushion are solid. The fit isn’t going to be for everyone, but for those that appreciate it, this may be the closest thing to a Kobe 5 reincarnation we can get. In terms of the Kobe low hierarchy, I put the NXT right behind my number one, the Kobe IV. It is just a well rounded performer with great traction, fun cushioning, excellent fit and stability and decent containment. The Kobe A.D. NXT is released as the immediate successor of Kobe Bryant’s first post-retirement model. A collaboration between the Black Mamba himself and Nike’s Senior Designer Eric Avar led to the birth of an innovative no-tie lockdown system that gives an uncompromised low-profile support, proving once again that Nike Kobe is a top-tier shoe line. Cushion. Similar to the Kobe XI, the NXT features a full-length drop-in Lunarlon midsole that provides responsiveness in the forefoot area. It also has a thick Zoom unit that gives full impact protection to the heel. The forefoot is made flexible by the foam’s articulated bottom. The drop-in midsole provides stiffness to the shoe’s structure. Traction. The shoe uses the same micro-tread traction pattern as its predecessor; however, the Kobe A.D. NXT has it full-length while the previous one had it only in the forefoot area. The NXT’s traction pattern extends to the medial side of the midsole for extra grip when making quick medial moves on-court. Its outsole is a translucent rubber that allows the Zoom unit in the heel to be seen. The clear outsole is also outlined by white rubber. Since the outsole uses soft rubber, it is advised not to use the NXT outdoors. Length and Width. The Kobe A.D. NXT runs very narrow. Even people with regular-sized feet are advised to visit their local shoe store so that they can try it on. Lockdown. The A.D. NXT has a one-piece bootie construction, ensuring a glove-like fit. It also features a no-tie toggle lacing system, which involves a Flyknit shroud held in place by nylon strands that are anchored on the sides of the shoe. The laces clasp and compress the upper onto the foot. On the heel is an external TPU counter that securely cups the base of the foot. The shoe utilizes two layers of lightweight materials on its upper. 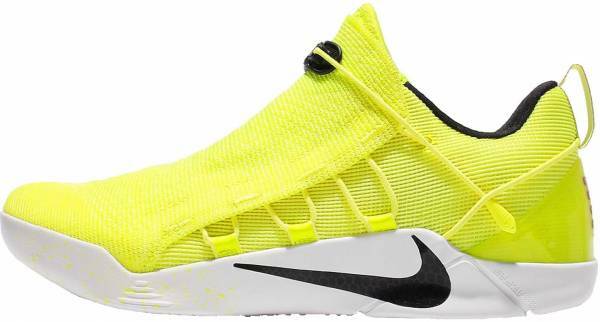 The outer layer is a TPU infused Flyknit shroud. The inner layer is breathable textile mesh. Together, these two hit that sweet spot between being a supportive material and a malleable one. Attached to the main body of the upper is the tongue that is made of the Nike Torch material. This component brings another level of breathability and allows the upper to stretch so that it's easier to put on the shoe. The drop-in midsole is made of Lunar foam encased in a Phylon cushion, with a Zoom Air unit under the heel. The outsole is made of translucent soft rubber. Although it takes after the Kobe A.D.’s minimalist look, the Nike Kobe A.D. NXT takes it a step further by incorporating significant elements into its subtle design. The tips of the laces are molded to look like snake heads, a clear nod to the Black Mamba. A lotus flower design, the Zen symbol of rebirth, is stitched into the center of the Flyknit shroud. On the left shoe’s heel counter are four horizontal lines that represent Kobe Bryant’s Achilles tendon injury in 2013. Other details on the shoe include Braille-like Kobe codes on the midsole of the shoe; one means unhinge while the other means end and begin. Both refer to the rebirth of Kobe’s shoe line. The Nike Swoosh is printed on the sides of the midsole while the Kobe logo can be found on the outsole, right heel counter, and on the center of the lace toggle. Kobe A.D. NXT’s clean aesthetic brings the shoe out of the court and to the streets, making it great for on-court and off-court use. The Nike Kobe A.D. NXT comes in several tonal hues. The Kobe Mambacurial line is inspired by Bryant’s love for soccer and the legendary Mercurial soccer cleats. The Nike Kobe A.D. NXT ‘Mambacurial’ comes dressed in College Navy and Igloo instead of the traditional pink and green combination.